Princeton’s historic preservation groups are coordinating to provide a weekend of activities to celebrate New Jersey’s 350th Anniversary this weekend, September 26 to 28. Activities are planned at the Princeton Battlefield State Park, Morven Museum and Garden, at the Historical Society of Princeton’s sites at Updike Farm and Bainbridge House, as well as at Rockingham and Drumthwacket. The Princeton Public Library and the Princeton University Art Museum will also be offering special anniversary related activities. Most of these locations offer free public parking save for the Princeton Public Library and Bainbridge House, and a free shuttle bus will loop between several sites on Saturday. As if to bookend the weekend’s activities, the Princeton Public Library is presenting two lectures, one on Friday evening and another on Sunday evening. Tom Fleming speaks on “The Quest for Justice in the American Revolution,” Friday, September 26, at 7 p.m., and Arthur Lefkowitz focuses on “Black Soldiers in the American Revolution,” on Sunday, September 28, at 5 p.m. Details of both talks can be viewed on the Library website: www.princetonlibrary.org. 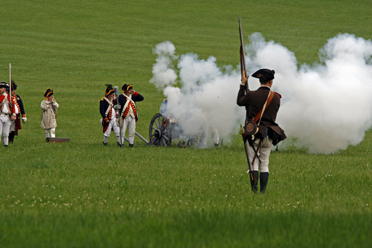 Courtesy of the Princeton Battlefield Society, events kick off at the Battlefield State Park on Saturday at 11 a.m. and run through the day until 7:30 p.m. There is sure to be lots of information on the early days of New Jersey as well as Princeton’s role in the American Revolution. A town crier will alert visitors to Royal Artillery demonstrations; displays from the National Marine Corps Museum; military encampment demonstrations of cooking, laundry, spinning, medicine, and others; musket drilling for kids; ice cream making and tasting; long-sword display; a display of work by members of the Princeton Photography Club; and a book signing with Michael Harris. There will also be tours of the Battlefield and the 1772 Clarke House as well as food and music. The musical group, Ministers of Apollo, will perform a concert for families between 5 and 6 p.m., to be followed by an outdoor performance of Shakespeare’s Pericles, for which visitors are asked to bring a lawn chair as well as a flash light and warm clothing. The play’s director is Sam Kessler of the Princeton Shakespeare Company. In the event of rain, it will be performed on Sunday, September 28. For more information, visit: www.The PrincetonBattlefieldSociety.com. At Morven Museum & Garden, 55 Stockton Street on Saturday, free events include Archaeological Discovery Day with interpretive tours and hands-on sessions from 9 a.m. to 4:30 p.m. and a Colonial Chamber Music Concert by The Practitioners of Musick, such as would have been enjoyed by the patriots who founded the new Republic, at 2 p.m. The program promises a rich and diverse selection of Jefferson’s, Franklin’s, and Washington’s favorite music, as well as a chamber air set for harpsichord composed by Francis Hopkinson. Performers are Donovan Klotzbeacher on harpsichord and John Burkhalter on recorder. For more information, call (609) 924-8144, or visit: www.morven.org. The museum is open for tours on the hour Saturday and Sunday from noon to 4 p.m., with the final tour at 3 p.m. In keeping with the presidential theme, the Princeton University Art Museum will offer docent-led tours featuring Charles Wilson Peale’s portrait of George Washington at the Battle of Princeton on Saturday and Sunday. Self-guided family activities about American Portraiture will also be available throughout the weekend. For more information, visit: www.artmuseum.princeton.edu. The Historical Society of Princeton (HSP), will be offering free admission to both of its historic sites on Saturday. The Updike Farmstead and Bainbridge House will be open from noon to 4 p.m. At both locations, the exhibition, “Princeton’s Portrait,” showcases the town’s history by means of vintage photographs drawn from HSP archives, many of which have never been exhibited before. At Bainbridge House, 158 Nassau Street, photos of Nassau Street stores, University students celebrating St. Patrick’s Day and Princeton Borough’s first African American police officer, Philip Diggs, show life in and around town. At the Updike Farmstead, 354 Quaker Road, images celebrate the land and a way of life that is now largely gone. Farmers toil in the sun; haystacks dot rolling fields; and a young boy shows off his prized hen. At the Farmstead at noon, there will be a special program on the events that unfolded in Princeton and Trenton from December 25, 1776 to January 3, 1777, the ten crucial days that marked the turning point in the American Revolution. For more information, visit www.princetonhistory.org. Rockingham, the home of former New Jersey colonial Supreme Court Justice John Berrien, where General George Washington stayed at the invitation of the Continental Congress, which was meeting in Princeton during late August to early November 1783, will be open on Saturday from 10 a.m. to 4 p.m. and Sunday, from 1 to 4 p.m. On Saturday at 1 p.m., Stacy Roth will host a “Revolutionary Tea” with tea lore, history, songs, and poetry. Mini-tours will be offered from 2 to 4 p.m. On Sunday at 3 p.m., Practitioners of Musick will present a talk and concert of 17th century music celebrating NJ’s Dutch heritage. For more information, visit: Rockingham.net. Special tours of Drumthwacket, the Governor’s Mansion, will be offered on Saturday from 11 a.m. to 2 p.m. But note that reservations are required. For more information, visit the Princeton Regional Convention & Visitors Bureau website, or www.VisitPrinceton.org or e-mail princetonbattlefieldsocinfo@gmail.com. For the official NJ350 Blog and a listing of programs throughout the state, visit www.officialnj350.com.